The view at the top of the page is of the 2010 total solar eclipse combines ground-based views (gray and white) taken from the South Pacific and space-based images from the SOHO spacecraft, which used a coronagraph to block out the sun and thus can’t view as close to its surface. 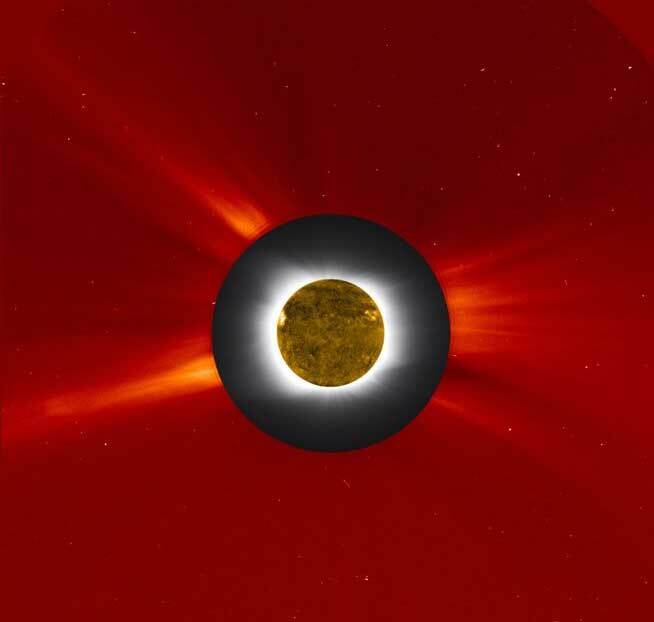 During the upcoming total solar eclipse, a team of NASA-funded scientists will observe the solar corona using stabilized telescopes aboard two of NASA’s WB-57F research aircraft. This vantage point provides distinct advantages over ground-based observations, as illustrated by this composite photo of the aircraft and the 2015 total solar eclipse at the Faroe Islands.